Isn’t this profound. We live everyday as if we are living our BEST life just because we wake up, go to a job, pay a couple of bills, love on our children, spouses, friends, ect., but is this our only reality? Is this the person who God REALLY intended for you to be? Are you willing to die, in order to really start living YOUR GRANDEST LIFE? What does dieing really mean to you? It’s not easy letting go of a perception that is so embedded within, and I speak from experience. However, I know that there is another realm of reality that lies deeply within, so I let go easily. When you can tap into your truest reality – not the picture perfect one – not the normal one – not what the world want you to be – not what your family want you to be, BUT, the one that was predetermined and masterfully created for you to live. The amazing life of divine order that was created for you to SOAR beyond your wildest dreams. The order of fulfillment. 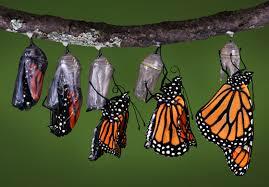 Like the butterfly that reaches metamorphosis. It SOARS because it has reached its fullest potential. It’s truly amazing. Make it an amazing week. #imlivinginmypurpose. Previous Post Do You Really Believe In What You Believe In?